8.17 points at 24 votes (rank 55). 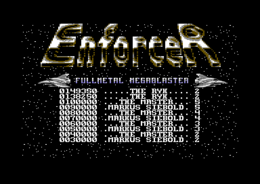 Enforcer, which is also named Katakis 2, is another horizontally scrolling space shooter by Manfred Trenz, which he wrote for the Golden Disk under the alias "The Master". You fly with an orbital glider through 6 different zones with rising difficulty level and each one big enemy at the end. The Enforcer-Fullmetal-Megablast is a battle glider, state-of-the-art. In the basic equipment it has a high performance pulse energy engine and a plasma rapid fire blaster. Moreover the EFM possesses a power beam, whose fire power is enough to desintegrate heavy armoured and big enemies. The EFM can versatilely be expanded and upgraded, by adding several modules, that appear in the course of the game. At the beginning four gliders are available, each of them is equipped with 3 smart bombs. In every zone further extra gliders are hidden, which only catch your eye when looking closely. By touching them they are added to your account. When all gliders have been destroyed, the game is over. 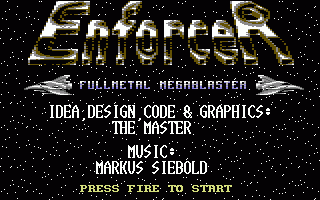 Provided that you have reached a highscore with your mission, you can enter you name into a list, which will be immortalised on disk. The levels are diversified, have nice graphics, well animated enemies and scroll smoothly. The sound is also well done. The boss enemy in level 6 reminds a bit of the intermediate enemy of Turrican level 4-3. 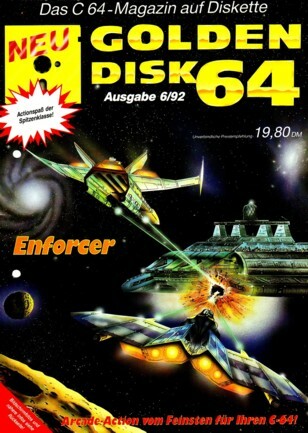 The glider is controlled by the joystick in port 2. By keeping the fire button pressed, the beam will load, letting go will set its destructive energy free. A smart bomb is activated through the SPACE key. During the game you can pause the game by pressing the CTRL key and continue by pressing the fire button. Red - scatter shot, 5 times upgradeable. Very effective against many weak enemies. Green - laser, 5 times upgradeable. The laser has a higher penetrating power, so it is rather effective when there are many enemies at the same time. Blue - reflection laser, 4 times upgradeable. Four laser beams are released from the corners of the glider. These rebound from the walls. Very effective against many enemies that are positioned around the glider. White "B" - smart bomb. Destroys all enemies that are on the screen. Very effective as a last resort. If a weapon is fully upgraded, further symbols for this weapon will give you each 1000 points extra. You can collect up to 9 smart bombs. The satellites destroy themselves as soon as their ship has been destroyed. The pause function of the CONTROL key can be cancelled by the fire button of the joystick. If you keep pressed the CONTROL key constantly, e.g. by putting something on it, and if you use a joystick with permanent fire, you will have a kind of "slow motion mode" with which hard parts can be made more easily. Else there are no official cheats. The pokes need to be entered with the help of a Freezer such as the Action Replay. 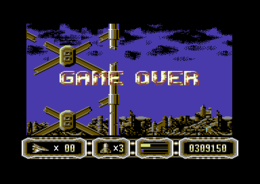 To avoid the crash of the loading system, you first have to loose all lives in the first level, enter your score into the highscore list and save. Now the loading system is not active and you can enter the pokes. The ones who find this too laborious have to get a crack version (see Miscellaneous). Logan: "The game has an excellent graphic and the sound is awesome. It's a pity there are only 6 levels and the intro is graphically not very spectacular." H.T.W: "Graphically and programmatically probably one of the best horizontally scrolling space shooters for the C64 with interesting possiblites to upgrade the glider, hordes of detailed enemies, driving background music, good FX and even a highscore list that is saved on disk. 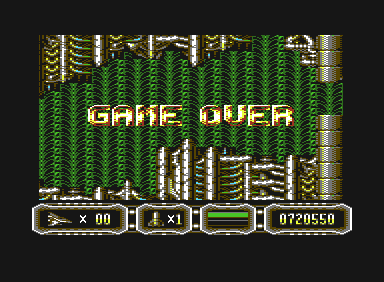 But there is also something negative to mention: unfortunately, the gameplay is not as balanced as it is in Katakis or even Turrican. It is partially too bustling. And six levels are just too little...". 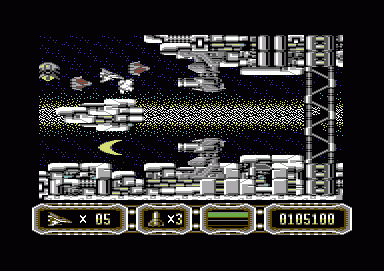 tilobyte: "The by far best space shooter in the style of the flying levels of Turrican 2 with a rare good playability and very balanced difficulty grade. Despite relatively few levels I am busy for a longer time and it belongs to the few that I like taking out every now and then." This page was last modified on 20 July 2017, at 12:37.